Today I want to share this Thai dish called Egg Bomb or Khai-Ra-Berd in Thai. I was so fond of this dish that I had to post on my Facebook wall asking my Thai friends if they knew how to make it and didn’t mind sharing it with me. Luckily, my friend Oh gave me some tips and I tried it a couple times and it was delish! • tomatoes – I would buy a huge tomato and use it all. • eggs – use 1 if you only make it for yourself, 2 if you are starving or want to share. Before prepping, start cooking some rice because it takes about 25-30 minutes. So, by the time you are done with your meal, your rice will be ready as well! Marinate the chicken with some soy sauce, oyster sauce and black pepper. Prep your veggies : Dice up tomatoes and carrots then cut up parsley cilantro. You can either fry egg/eggs before or after, depends on how good you are at multitasking. Let’s assume that you are good. Just make a sunny side of egg and don’t over cook it. Set it on a plate. Turn on the stove and use a medium sized pan. Once you think the pan feels warm, coat the pan with some vegetable oil or Pam spray and remember not to use too much oil. Then cook the chicken till it turns a little brown and add soy sauce and oyster sauce. Next, add carrots in and cook till they are a little soft. Last thing you do is add tomatoes and parsley cilantro then mix them all together. Try not to over cook it. If you like it spicy, I recommend you to add a little chili pepper ( I usually use just one but mince it well ) Once it’s all done. 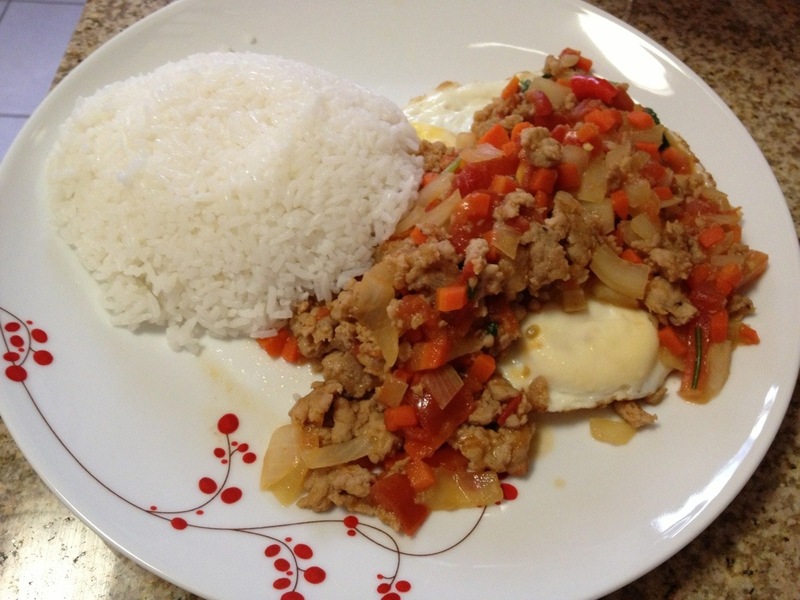 Serve it with the egg/ eggs you previously cooked and place everything with your cooked rice!